I decided to make barbecued chicken with a Sichuan glaze this Sunday. This is something a Chinese cook from “the Mainland” would never do. This, however, is a California Fusion recipe, taking something from one cuisine and mashing it together with the techniques of another. I am also serving dàn dàn miàn and pickled cabbage. The Chinese do not do a lot of barbecuing. Even Chinese “barbecued pork” is more roasted than cooked over an open flame. The reason for this should be obvious. Barbecuing may produce unique flavors, but it is energy wasteful and highly polluting. If one billion Chinese “fired up the barbie” every weekend, they would soon run out of wood and choke to death on the smoke. Only in the wide open spaces of Inner Mongolia and Xinjiang do they have a tradition of true barbecuing—and even they do it with energy efficiency. Note: The Chinese are already struggling with the many problem that arise from so many people trading in their clean, energy-efficient bicycles for new “modern” cars. Smog already deadly from the use of coal for cooking has reached the proportions of London’s Great Smog in some places. Even in San Jose I have to check the Spare the Air site to make if using my barbecue is legal today. The flavors of flame kissed meat is not to be missed, but it is definitely a treat. After Dinner Note: This came out really moist and flavorful. 1. Put all of the marinade ingredients into a small pot and cook it, stirring constantly until just thickened. Tip: You do not want the marinade to come to a full boil. You want it just hot enough that the corn starch does its thickening thing. 2. Transfer half of the marinade to a bowl and reserve. Tip: This will be used later as the glaze. 3. Cut the chicken into four pieces—breast and wing, thigh and leg. Note: Cut along the spine, remove the last joint of the wings and the breast bone. Save these for soup stock with any giblets. Without damaging the skin too much, pull off any large lumps of fat. 4. Cut 3-4 deep scores across the breasts and on both sides of the thighs and leg. Tip: This is an Indian Tandoori chicken technique that allows the marinade access to the interior of thick pieces of meat and a quicker cooking time. You are trading moist meat for heightened flavor. However, do not overcook the meat after doing this or you will end up with chicken jerky. If you prefer your chicken super moist, skip this step. 5. Spread the remaining marinade on the chicken pieces and put them in a gallon plastic bag. 6. Refrigerate for at least two hours, turning over at least once to let the marinade flow over the meat. Tip: Marinating overnight, turning sever times, is better. 7. 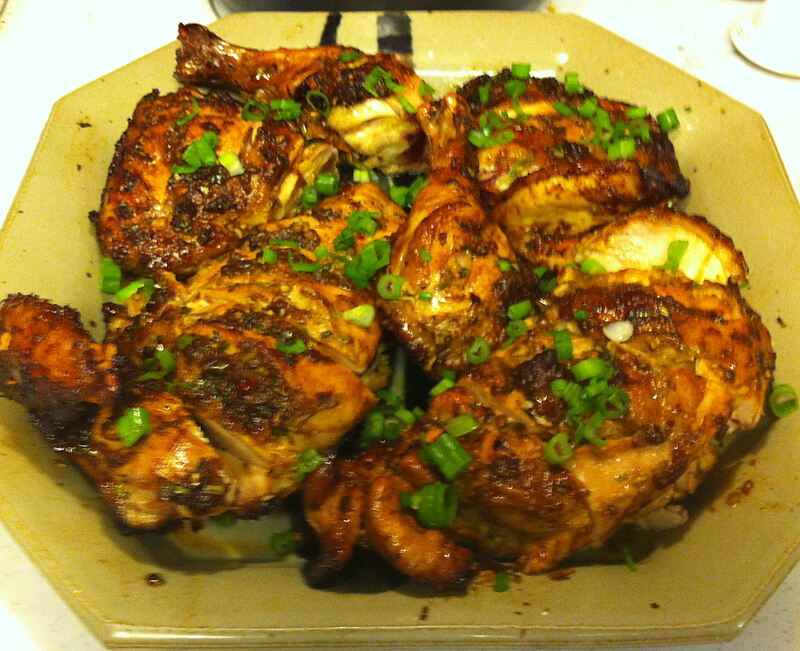 Set the chicken on the counter for one hour before barbecuing, so that the meat warms to room temperature. 8. Build a bi-level fire in your barbecue. Tip: Move the coals to the back of the grill giving you a hot zone for searing and a cooler zone for slow cooking. 9. Use paper towels to blot the chicken. Tip: You are not trying to wipe off all of the marinade, just to remove the excess moisture so that you get a good sear. 10. Put the reserved marinade in a small pot and add the honey. Warm the glaze slightly, but do not boil. 11. Lay the chicken skin side up directly over the coals. Close the barbecue lid and close the top vent. Lear the barbecue undisturbed for three minutes. Tip: While closing the vent will eventually reduce the heat of the grill, the lack of oxygen inside the barbecue will prevent the fat dripping from the chicken to flare up and scorch the meat. Note: Starting skin side up allows the skin to completely dry before you sear it over the coals. 12. Turn the chicken skin side down directly over the coals. Leave the lid open unless there are a lot of flare ups. Leave the chicken undisturbed for five minutes. Tip: If there is a lot of flames, close the lid with the vent closed. 13. Move the chicken, skin side up, to the cooler side of the grill. 14. Brush the chicken with half of the glaze and insert a constant-read thermometer into the thickest part of the breast. 15. Close the barbecue lid and open the top vent. 16. Cook undisturbed until the internal temperature reaches 150º F.
17. Brush the chicken with the rest of the glaze and close the lid again. 18. When the internal temperature reaches 155º F, remove the chicken to a plate and tent with foil. Tip: The foil will keep in the heat and the internal temperature will rise to a safe 165º F.
19. Let the chicken rest, covered for 10 minutes. 20. Cut the chicken pieces into portions and garnish with the green onion and a sprinkling of fresh ground Sichuan pepper.